We are your Canadian distributor of 3M Scotch ATG tapes (Adhesive transfer tapes) and 3M Scotch Adhesive applicators 1/2" (ATG700) and 1/4" (ATG714) serving the Canadian and USA market for more than 20 years. With the 3M ATG System, you get versatility, convenience and speed. The Adhesive transfer tapes are really thin strips of acrylic adhesive, pre-applied on special release liners and are easy to apply. Readily bond, join, mount, or laminate materials such as paper, plastics, metal, and more with no mess or clean up. Use the friendly ATG 700 and ATG 714 dispenser with your favourite 3M transfer tapes, while simultaneously removing the liner. 3M ATG 987 Tape - permanent, hi-tack, 1.7mil all-purpose transfer tape that offers good adhesion to most paper stocks. 3M Scotch ATG Guns are a wonderful alternative to tape runners. It is by far the best and most popular tape dispensing system in the paper crafting industry. 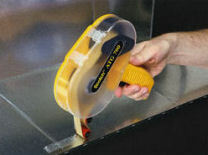 3M Scotch 908 ATG Gold tape is high tack, acid free, photo-safe, pressure sensitive, permanent ATG tape. It is great for matting & framing pictures, artwork & documents, memory & scrapbooks, and other general crafts. 3M Scotch ATG 924 tape is a permanent, hi-tack, 2.0 mil all-purpose transfer tape that offers excellent adhesion to most paper stocks. Bonds a variety of similar & dissimilar materials. 3M Scotch 969 ATG Tapes is a extremely high tack ATG Tape. High initial adhesion to a variety of surfaces including many plastics. If you are a stamper, scrapbooker, card maker, paper crafter, or anyone who regularly uses a tape runner, then take a closer look at 3M's Scotch ATG applicators and refills. There are many varieties of adhesives to choose from. You will not be dissapointed.